Boys Will Be Boys? Hardly. So now that the Times has finished serving it’s 4-course meal of UW thugism (plus one inspirational story of Anthony Kelley’s success, despite the program) , what do we as Cougar fans think? Plenty, obviously. But I’m going to take a slightly different angle. No jokes or barbs tonight. Why? Too easy to kick a dog while it lies in the gutter? Too easy to laugh and make fun of a program that was out of control because this level of thugism hasn’t happened at my school? Nope. I’m not going there, because it doesn’t feel right. At all. The jokes aren’t very funny when you think of the victims in all this. Like the girl who was raped by Jerramy Stevens, only to have the case hidden away from public view and Stevens got to keep playing. Or the battered women in the lives of Pharms or Curtis Williams. Or how about the regular, non-football people that were beaten senseless in all the assault cases and fights? More than anything, I’m just embarrassed in reading all that stuff. I’m embarrassed for the victims of these thugs. I’m embarrassed that prosecutor Norm Maleng in King County chose to look the other way in many instances, if not bury evidence that only recently came to light due to the Times reporters requesting that records become unsealed. Like Vince said earlier in the week at SR.com, I’m mad too that people that were trusted in authority acted like complete idiots when they should have done the right thing, time and time again. I’m embarrassed that 25 players from that 2000 team were arrested at some point or another during their stay at UW. That’s not boys being boys. That is much, much worse. I’m embarrassed for Rick Neuheisel. He should be, without question, absolutely ashamed of what happened on his watch. The element that was rampant during his run as head coach is pathetic and inexcusable. I seriously wonder what UCLA officials might have thought if these details came to light before they hired old Rick. He might still be a QB coach in the NFL right about now. Who knows, maybe Roger Goodell would suspend him if he were currently on an NFL staff! What a joke. But most of all, I’m embarrassed for family and friends associated with UW in one form or another. Family and friends that adored that 2000 team, with all their Tui-led comebacks, and how tarnished that must feel now. 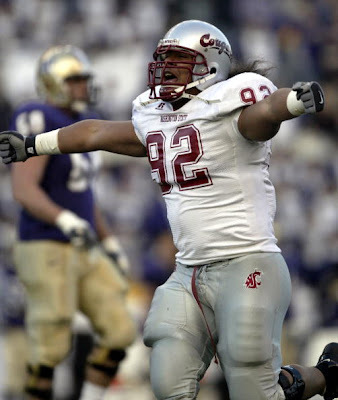 I mean put yourself in their shoes for a moment – what if, say, the Spokesman suddenly rolled out a series of F-UPS from the 1997 WSU Rose Bowl team, or the 2002 Rose Bowl team? And what if it happened the week before letter-of-intent signing day, as well as in the drive to get the stadium renovated? I’d be bitter, angry, defensive, probably a little in denial. But most of all, EMBARRASSED AND ASHAMED THAT IT HAPPENED AT MY SCHOOL. I would only hope that we could learn from history, for those that don’t are doomed to repeat it. Some of you know I have family with very deep UW ties, family that have donated and supported the UW program since before I was even born. Without question, I’m embarrassed for them, and I hope beyond anything else that they were as unaware of these things as you and me. Ok, down off the soapbox. A’i Ahmu got arrested for mixing it up at Pike’s, including underage drinking and busting a window. That’s now two projected starters, Xavier Hicks the other, that have screwed up in the last month. As Vince says in his blog, all eyes – including the eyes of players – are on the coaching staff to see how they handle these things. Wulff said himself the day he took the job that there needed to be a culture change in the program. Not to speculate – but that’s all blogs really do, speculate based on what’s in the news? – but maybe there is some deeper problems with this program other than changing the culture? All I know is that in light of these recent UW stories, the media near and far is going to be on high-alert in scouting out player indiscretions. Let’s hope Wulff and company do the right thing, no matter the caliber of player, if they cross the line that we all know is out there. On a much better, happy note, I heard a great Wulff recruiting story today. Turns out that after the big recruiting weekend after the Oregon basketball game, a bunch of recruits and their families took a bus to Spokane on Monday to catch their flights home. Well, halfway to Spokane, the bus breaks down. They are in the middle of nowhere (you’ve made that drive a million times, so you can picture exactly where I’m talking about), and not only is the bus broken down, but there’s NO HEAT on the bus. Our Pullman source says it was 29 degrees INSIDE THE BUS. So Wulff gets the call that the bus is broken down. But what does he do? Yes, he gets the wheels in motion, so to speak, to have a replacement bus sent right away. But he also hits the road and drives out to where they are and waits with the players and families the whole time until the replacement bus arrives and takes them on their way! No way was he just going to sit there in his office while his recruits and their families shivered in the cold. And how did that work out? Every player on that bus – every one – ended up committing to WSU! Well, ok, that’s not 100% true. There was one player who did commit, but ended up changing his mind and is now headed for USC (you can probably figure out who). But otherwise, every other player is set to become Cougs! I couldn’t help but be impressed by that story. I know it’s not THAT big of a deal, but that kind of stuff goes a long way in the eyes of players and families. It shows what kind of guy Wulff is, and that uh, yeah, I think we’ve got ourselves one hell of a recruiter running the show! Major hat-tip to coach Wulff on that one. I look to my left, I look to my right, I look straight ahead, and still no Erik Bedard. What a soap opera. Tonight, Geoff Baker has the audio clip of Adam Jones over the weekend telling the reporter that he had been traded in the Bedard deal and that he was headed for Baltimore the following day. Wow. What a weird story this has become. Why can’t trades just get done anymore? Now many claim that Angelos is upset that Jones spilled the beans and is trying a last-ditch effort to ink Bedard to an extension. Yet the offer of 4-for-Bedard, headlined by Jones, is by far the best the O’s are going to get. Especially when you look at the haul that the Mets gave the Twins for Santana, without giving up their top hitting or top pitching prospect? I guess there’s a reason the O’s have had 10 straight losing seasons, and really have zero hope for any success for the next several years. Angelos is borderline-insane in his mini-Steinbrenner ways, and he’s on the verge of seriously blowing it! You are currently browsing the archives for the Thugs category.